At Upper Clapton FC we have a fantastic 4G All Weather Pitch which will soon be available for outside lettings. 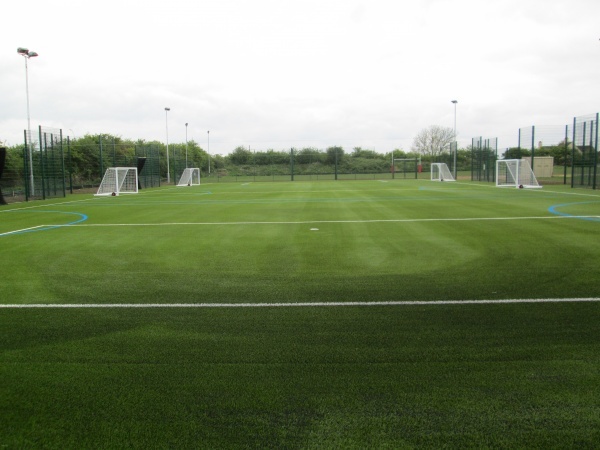 This modern facility, the installation of which has been supported by the Rugby Football Union and Sport England, is marked out to enable up to three 5-a-side football matches to take place at the same time or one larger format game using the full length of the pitch. Of course, football is not the only sport that can be played on the surface - almost all sports and activities can be carried out on the pitch. We do not however recommend that the pitch is used for Hockey. The area is fully floodlit and access will be via a secure entry system which guarantees that only the group that has paid for the pitch can gain access. Ample free car parking at the Club means you are only a few steps away from playing on the most modern, high spec all weather surface in West Essex. When considering booking the pitch we request that you take note of the guidance in the attached PDF file which sets out the recommended footware for use on the surface. These manufacturer recommendations - which must be adhered to - are made to reduce the risk of injury to people using the pitch and to reduce the risk of the pitch being damaged. To book use of the pitch - whether it be single time slots or block bookings covering a number of weeks - please use our on-line booking system here. This is the only way to book use of the pitch.